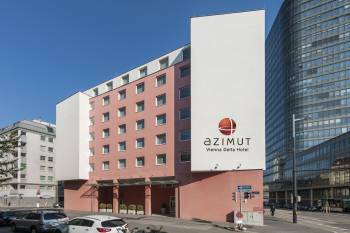 The AZIMUT Vienna Hotel Delta is the perfect place for tourists as well as for business travelers to stay. It is just 2 walking minutes away from the main train and subway station Südtirolerplatz. And round the corner – the “Favoriten Strasse” – the pedestrian zone with international flair! Shops, restaurants and cafés invite you to linger a few hours! Easily accessible – near the Wiedner Gürtel – Outer Ring Road – next to the Südtiroler Platz (railway station, bus, tram and underground connections). The ideal location for tourist or business activities in or near the City of Vienna. Just 3 underground stops to Vienna´s historic centre – surely the perfect destination for exploring Vienna! The hotel reception staff are at your service 24 hours a day and are happy to answer any questions or offer assistance. The hotel offers 180 rooms in different cat egories and free High speed Internet Access and a cosy bar. The hotel’s amenities also include an evening bar, a spacious breakfast room and two conference rooms for up to 12 people. There is an internet corner in the hotel lobby with work stations. Underground parking is available at a charge. The AZIMUT Vienna Delta Hotel have two 31m2 meetingrooms up to 25 persons.The Meetingrooms in the 6th and 7th floor offers standard conference tecnic, Flipchart, Beamer, Whiteboard, Overheadprojector and a own frigde in the room.Individual conference packages are offered personally like to meet the needs of guests.The meeting rooms do not have daylight.Should you need larger meeting rooms with the newest modern technology, we work with a conference center on the opposite side of the street.We are happy to answer any questions you may have!